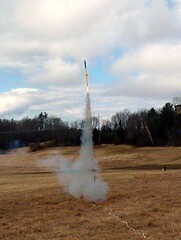 The snow is almost gone and we've had our first TARC launch of the year so it must be spring. As March days go, it wasn't bad. The winds seem to be less than what was forecast but it would have been nice if it was a little warmer. Several teams showed and made a variety of practice and qualification flights. As usual there were some interesting designs. I tried to put a picture that Tony took of one of them on the left but it seems that's not going to happen until webmaster Howie installs the latest software revision. Wait, I think I fixed it but the gallery still doesn't work. Our Winter Follies launch had everything you could ask for in a winter launch. There was snow, it was cold, and for most of the day it was bright and sunny. The snow was powdery and on most of the field it was just short of boot height so recoveries were not much of a problem. 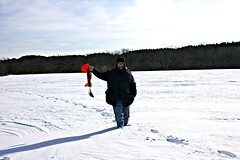 The soft snow offset the plastic wad recovery with cold parachutes. The town plowed the parking area for us and there were at least 21 vehicles parked there. We had 109 flights with our usual range from MicroMaxx to G. There are some photos here and here and videos here and here. The post launch debriefing was held at Not Your Average Joes (they get a plug because they gave us free appetizers).